Examples, solutions, videos, worksheets, games and activities to help Algebra 1 students learn about equations and the function notation. The following diagram shows an example of function notation. Scroll down the page for more examples and solutions of function notations. How to write equations in function notation? Functions have dependent and independent variables, and when we use function notation the independent variable is commonly x, and the dependent variable is F(x). Writing equations in function notation. Using function notation to find the value of a function for a given value of x. Also, the relationship between function notation and the points on the graph of the function. 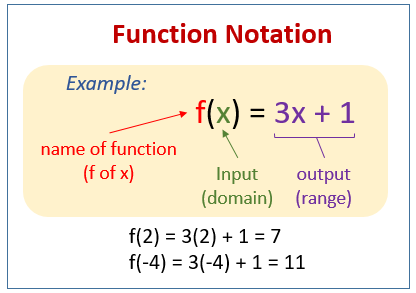 A basic description of function notation and a few examples involving function notation.